Fine by me! It gets me moving to have a helper. Her very young daughter also came, and was a surprising amount of help. I don't get why people write off the help of children. They are generally pretty competent, until they quit. We got the spinach pulled. It was so far gone, it had flowers. A lot of flowers. It filled the entire dump wagon. Bagged to take home, we got two tall kitchen garbage bags full. 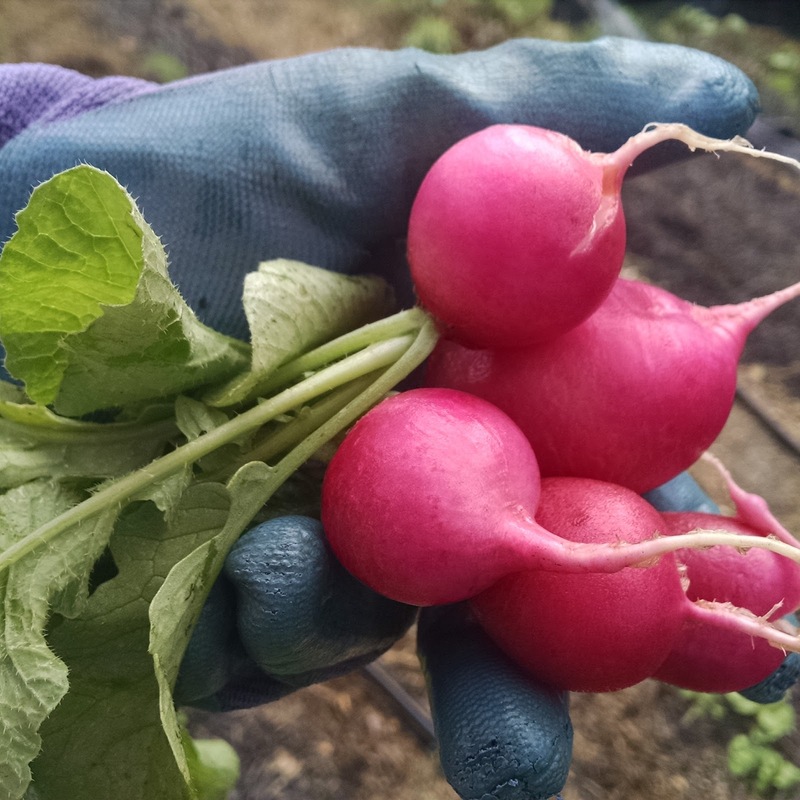 We were going to pull all the radishes, but I didn't have the courage. They are starting to bolt too (a.k.a. make flowers for seeds.) We pulled about 50, which was maybe a fifth of one bed. 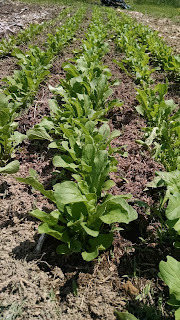 Then we cut arugula and lettuce. We used the 5 gallon buckets: 3 and a half buckets full would be what? 16+ gallons? It was enough, so we quit harvesting, but we hadn't made a dent in the lettuce yet. 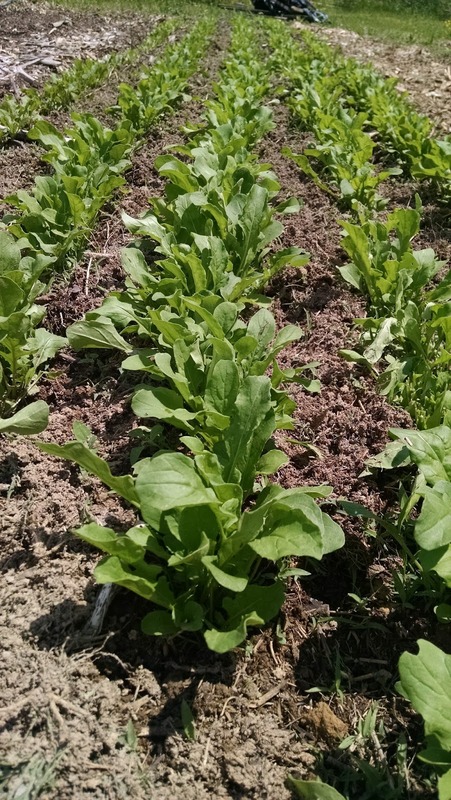 3 lbs of arugula per row. Oh my. Then we bickered about how to split it, since neither of us wanted to take more than we could use. So, maybe we should have laid off the cutting earlier, eh? Sometime in there we planted a second crop of squash and beans. Seemed like we got a lot done, so we called it a day! About 30 minutes later, the neighbor kid shows up to play. His mom comes to check on him, and spends a little time weeding the beets. Then we discuss the broccoli that never made heads, and decide to try using her kale chip recipe to make broccoli leaf chips. OMG!! They were so good! Salty, with olive oil, I gobbled them up like popcorn! Thinner than tissue, they just dissolved into crunchy goodness as soon as you put them in your mouth! My kids had gone bike riding, so they missed the first batch. Then they missed the second batch. 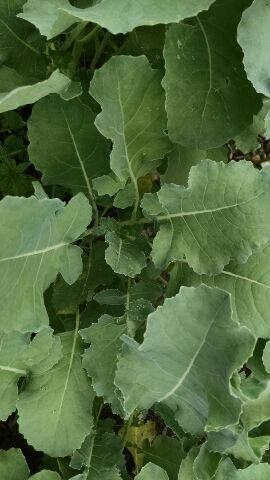 I went to plant more broccoli. The recipe tab at the top has this, and a bunch of other healthy, cheap, delicious recipes for lazy people who don't like to cook. I'll see you there! What is he called vegetable?